Get your GPSmyCity app membership, now! Dear fellow travelers! We are delighted to announce that one of our tours – 15-Day Fascinating Tahiti on Aranui Cruise Tour – has been nominated as an Unordinary Trip of the Month by InfoHub.com , the #1 travel portal on the Internet specialized in the out-of-ordinary vacations . This is definitely a unique cruise for a unique experience during which our guests have the opportunity to discover the treasures of Tahiti and Her Islands on board of a ship that embodies the spirit of “Mystery”, and we are thrilled to see it highlighted in such a way! In light of this, we are excited to offer our guests a special prize! Any of you who book the above tour before November 10 , 2017 may be eligible for a very special prize from InfoHub’s sister-company GPSmyCity – publisher of travel apps for Apple and Android. The GPSmyCity app features offline city maps, self-guided walking tours and travel articles for 1,000 cities worldwide, using which you can turn your mobile into a personal tour guide. With this app you can explore many major urban destinations in the world on your own, at your own pace. The GPSmyCity app works offline so there’s NO need to worry about roaming charges when traveling abroad. 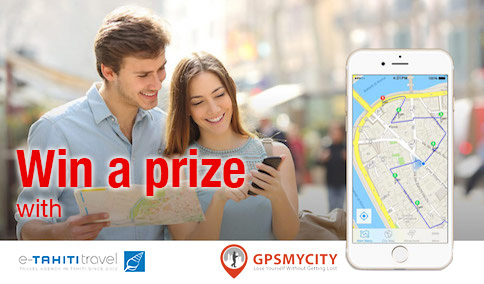 A lucky winner will be chosen at random to get a one-year full membership of the GPSmyCity app including access to ALL the GPSmyCity content – over 6,500 self-guided city walks and travel articles – to the total value of over $8,000!!! Book now and enjoy your Tahiti experience with e-Tahiti Travel !